Oranges are often referred as golden apple due to its colour, taste and also because it is a super food. Oranges are sweet, tangy and full of health benefits. Oranges are the perfect super food with loads of health benefits; Oranges are full of Vitamins, Minerals and Nutrients, and health benefits of oranges includes teeth, gum, bones, eyesight, kidney, digestion and weight loss. Today, in this post, we are going to talk about all the health benefits of oranges and how to use it and benefit from it. Orange is the most common citrus fruit that is consumed in India and around the world. It is the part of many delicacies like cakes and pies, smoothies and ice cream. Not only the orange fruit, but also the orange peel and leaves are equally beneficial. And today, we are going to learn about many health benefits of oranges and its application on skin and hair. Judging by the high nutritional value of the orange fruit, you can guess that this sweet and delicious fruit can serve a lot of health benefits. Starting from weight loss, curing skin problems, taking care of the internal organs of the body, this fruit is just magical. It is often said “an apple a day”, but taking one orange each day can be equally beneficial for you, it can protect you from harmful diseases like cancer and also improve your immunity. Here are the most surprising health benefits of orange and why it is worth including your daily fruit intake. Vitamin C is the primary water soluble anti oxidant in the body; it boosts up the immune system and also takes care of the outer and the inner environment of the cells. And oranges are great source of Vitamin C. A medium size orange of about 125 grams can fulfill about 93% of daily needs of vitamin C in your body. Oranges are immunity boosting fruits, and it helps to prevent the seasonal cough and cold, ear and eye infection, and some other common diseases that may be caused due to weaker immunity. Most of us consume too much of sodium, through salt, but not as much of potassium. Too much of sodium and too little of potassium can be disastrous for your heart, and it could cause heart related issues. Oranges are called as the heart healthy fruit because it contains potassium and helps you to keep your heart healthy. Hesperidin and Pectin present in oranges helps in lowering the cholesterol thus reducing the risks of heart diseases and also helps in weight loss. The lowering of cholesterol will also indicate lesser chance of strokes and thyroids. It also helps the body by slowing down the absorption of fat. The body cells are prone to damages by the free radicals. Oranges have a compound D-linonene which helps in fighting and also preventing various kinds of cancers like colon, lung, kidney, skin, breast cancer etc. Vitamin C present in the oranges destroys the free radicals and thus prevents the fatal disease. The vitamin C and potassium play a vital role in protecting your eyes from diseases and minor infections. 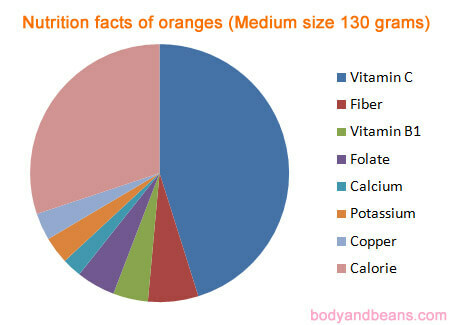 Oranges are good source of both vitamin C and potassium. The oranges have minerals and vitamins which take care of your retina, cornea, and also the blood vessels of the eyes. It will strengthen your vision so that you do not have to suffer from weaker vision and glaucoma degeneration in old age. Eating an orange a day, can help you to prevent or cure night blindness as well. If you are feeling low, eating a medium size orange can quickly boost your energy level. If you are trying to lose weight, then just grab an orange daily. Oranges have water content in them, so that will keep you hydrated for longer hours. The orange will make you feel fuller, so you will not feel hungry easily. Also, this naturally sweet fruit can also meet your sugar cravings. You can soothe your tongue and appetite without harming your body. Oranges are also known to increase the Basal Metabolic Rate of the body, thus reducing the accumulation of fatty acids in abdomen, shoulders, thighs etc. Severe kinds of arthritis like rheumatoid arthritis can be very painful; you may have difficulties in walking, or moving your muscles. Daily consumption of oranges can give some relief to cure arthritis. Oranges help in lowering the uric acid levels in the blood which are responsible for causing arthritis. The diseases like insomnia, nervousness, depression, asthma can be cured by daily consumption of oranges. Oranges ensure that the blood is circulated properly through the lymphatic systems. Blood circulation is important as it also results in proper functioning of the hormones. Oranges have folates, potassium and calcium which take care of gum problems, and also help you to get rid of bad breath. Oranges are rich in fiber and contains high glycaemic index which makes it a perfect food option for diabetics. Those who are suffering from diabetes are advised to not eat sugar or any sugary products. But they can easily eat an orange and full fill their craving for sweetness. In 2013, the worldwide production of oranges was 71.4 million metric tons. The orange leaves and the peels are also used in various purposes, both in cooking and also for curing various types of diseases. The oranges are very nutritious and healthy fruits. Loaded with vitamins and minerals: Orange contains vitamin C, fiber, folate and Vitamin B1. It also contains Pantothenic acid, copper, potassium and calcium, which is essential for good health. Antioxidant and anti-inflammatory properties: oranges have 170 different kinds of phytochemicals and more than 60 flavoinoids. Vitamin C present in oranges can do wonders, not just in terms of your health but also in terms of your beauty. 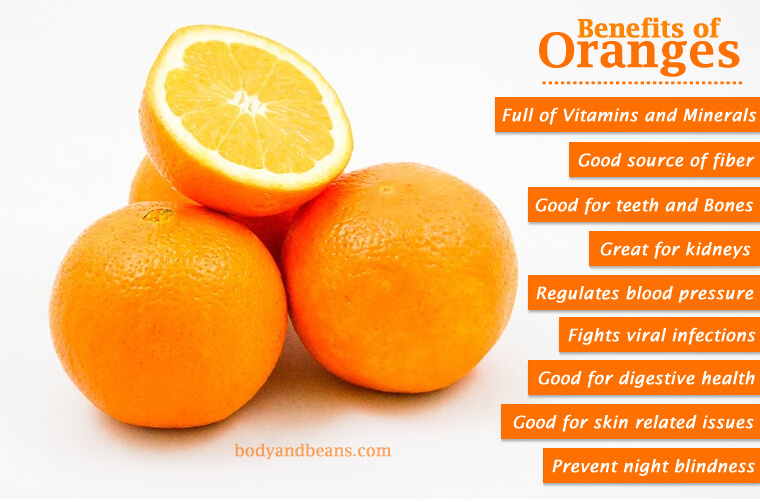 There are several benefits of oranges for your skin and hair. Orange peels have higher content of Vitamin C than the orange fruit even. So, the orange peels can be used to cure dark spots, acne, and also pigmentation. Apply the paste of the peel daily in affected areas, and you can see the spots getting lighter and finally they will be removed completely. Did you know that you can use the orange peel instead of the expensive anti aging creams? Orange peels have vitamin C which helps in restoring collagen in your body. This collagen helps in firming of the skin, and also prevents wrinkles and also the premature signs of aging. Orange peels are natural bleaching agents. You will often find that orange peel extracts are used in bleaching packs which are available in the market. Instead of the cosmetic products, you can use the orange peels and they will bleach your skin, turning it fairer and glowing. It will help you to protect your skin from the harmful UV rays of the sun. The pollution and also the harmful rays of the sun destroy the skin, and results in acne and blackheads. The orange peels are a wonderful scrub; you can apply the scrub in the affected areas and get a beautiful skin naturally. Orange peels have anti oxidants and citric acids which help in removing the dead cells from the skin for better air and blood circulation. You can rejuvenate the dry skin with the orange peel toner. This is suitable for all skin types, oily, dry and also normal skin type. It is very easy to apply the orange peel on your skin. You can grind the peel in the mixer grinder and then make a paste. You can mix some milk and honey with the peel to make a super beneficial face mask. Keep the mask for one hour, let it dry and then wash it off with cold water. You can just take the peel and rub it on your skin, which will act as a nice scrubber. But make sure whatever you do, be it toner, scrubber or a mask, your face must be clean. Do not go out in the sun immediately after applying the orange peel in the sun. Is orange juice good for hair? Yes. Vitamin C, folic acid, vitamin B, and insonitol are some of the most important nutrients for proper hair growth. Oranges contains all of these nutrients and hence it can be magic to fight hair fall and promote hair growth. If there is something too painful to bear, then that is hair fall. The pollution and the stress can lead to severe hair fall. The orange juice has fiber and folate which can promote hair growth. Orange juice can be used to fight hair fall and promote hair growth. You can mix orange juice into fresh curd and apply it on your hair to clean the scalp and nourish the roots of hair. If your hair is dry and frizzy, then the orange juice can work as a hair conditioner. Vitamin C, present in oranges can properly condition your hair. You can make a conditioner by mixing orange juice, honey and water and apply it as a conditioner. Start with shampooing, then apply this conditioner and leave it for 10-15 minutes and then wash.
Dandruff is caused in dry scalp; orange juice can moisturize the scalp and help you remove dandruff. And not only orange juices, you can also apply grinded orange peel to your scalp and fight dandruff effectively. Take the eel of a couple of oranges and grind it into a fine paste. Apply this on your scalp and leave for about 30 minutes. Wash it off with normal water and feel the difference. Just do it twice a week for a few weeks for best results. You can make a thick paste of orange peel and then mix some honey in it. Then apply the hair mask in clean hair. Wash your hair properly before applying the mask. The wet hair helps in better absorption of the minerals into the scalp and, reaches the roots and the hair follicles. You can also make a liquid hair conditioner for your hair by mixing the orange juice and honey. Apply the liquid in wet shampooed hair, and then wash off after 10 minutes. Orange leaves may not be as popular as the orange fruits and orange peels, but the orange leaf tea is used in curing ulcers and also gastrointestinal problems. You can also make a decoction of dried orange leaves and drink it with warm water. You can have one whole orange daily in your breakfast. Nothing is better than consuming the whole raw orange daily. You can also make some fresh orange juice at home and drink it. It is better to drink the homemade fruit juices than those available in the market. You can also grind some orange peels and spread it on some foods like granola and cereals for better taste. You can also have some fresh juicy pulp of oranges in your fruit salad as well. Are you taking orange daily? How are you taking it? Share with us in the comments section below.